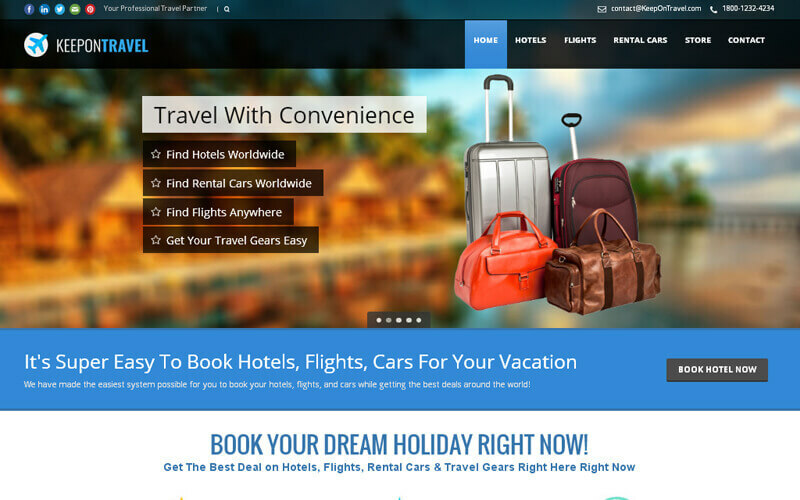 Start your own Profitable, readymade travel booking script website today with highly converting designed website. This hotel and flight travel search engine script works as a search engine for the travelers to find the best value hotels, flights, as well as car rental deals in planning their trip. The website has 2 major travel affiliate programs that will pay you when people are using this website. All they’ve got to do input for their desired travel destination, the relevant dates, and the Search Engine will automatically sift through its database and return only the best deals tailored to the inputted criterion. Each time your traffic CLICKS on the deals are suggested by the Search Engine, you’ll be making AFFILIATE COMMISSIONS. The average commission you can expect to make with this website is $1 – $4 per visitor. This means with as little as 100 visitors per day you could earn $100 – $400 per day. This readymade affiliate scripts is professionally designed and developed in such a way that ensures a complete user friendly service. IMPORTANT: You don’t have to make a single sale in order to make money! With this premium design and framework, the site has been developed as user responsive, reliable and superior among its competitors to make sure your user satisfaction. So more your visitor clicks, more you earn. Increasing your user’s average time has spent on the site increases the chances of more clicks and higher affiliate commission. This site is 100% AUTO-PILOT. That means the website is fully automated and self updating. All that is required to start earning money from this website drive traffic. Also this website is very newbie friendly as there is no maintenance required. This site is brand new and has not generated any traffic. To help with the traffic generation, I will include a step by step guide on building traffic. This is my own personal guide that has worked for me without a problem and I know it will work for you. Your business/websites are nothing without marketing so this would be the most important element to anybody’s online success. This is really an awesome script. It is enhanced with so much new modern features which are essential nowadays. I like the customization in this script because I was able to put my own ideas to enhance and improve myself. And the technical crew helped me to do that so easily. Thank you so much. Good templete designs and i’m really satisfied with this script. Thank you phpscriptsmall! Awesome script!! Even for the beginner with great flexibility and customizability. It’s having more advanced options.